Thanksgiving is the time for hearty and rich side dishes like mashed potatoes and that sweet potato thing with mountains of brown sugar and marshmallow. If you are looking to mix a little something healthy in under the radar, this might be your ticket. I’ve combined some of fall’s favorite squashes and vegetables with sweet persimmons for the perfect starchy side dish. What’s a persimmons? Persimmons are a small orange fruit. They have a thick outer skin that tastes the best when cooked down a little bit. It’s a fruit with a starchy texture but sweet taste. They pair well with nearly anything, from Roasted Chicken to vanilla ice cream, and one of my favorite ingredients in late fall. 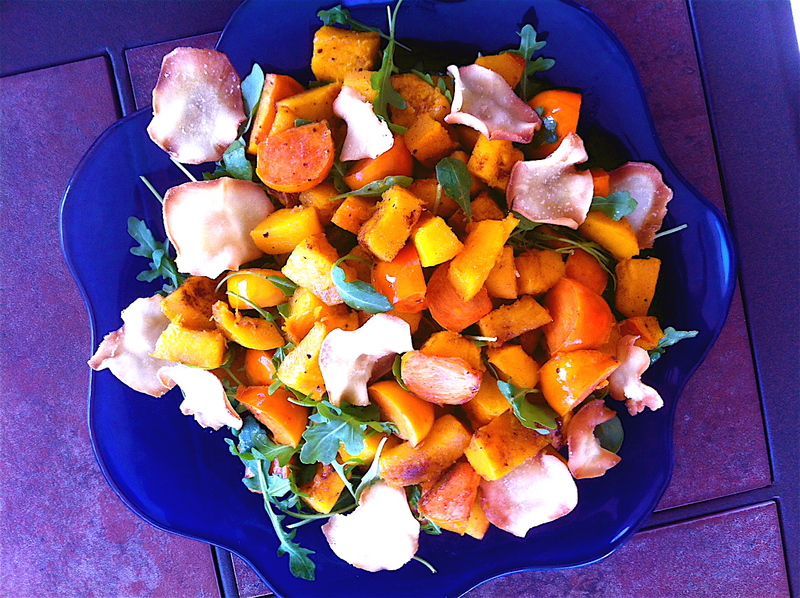 Here they complement pumpkin, add a nice sweetness to peppery arugula, and embellish a honey-cider vinaigrette. A relatively painless side dish as the holidays come marching in. 1 sugar pumpkin, cut in half with seeds and pulp removed from the center with a spoon. Toss both halves of the sugar pumpkin with a little bit of vegetable oil. Season with salt, pepper, and cumin. Roast in the oven for 30-40 minutes, or until tender. To make the crispy parsnips, use a mandolin to thinly slice the parsnip into potato chip- like rounds. You’ll want about 2 dozen slices. Put the slices and the flour into a zip lock bag and toss well so that the slices are coated. Dump the flour and parsnips into a colander (over a trash can) to get rid of all the excess flour. Heat a medium sauce pan with 3/4 cup vegetable oil. Heat to medium heat, or until flour starts to spatter when you drop it in. Fry the parsnips, about 8 at a time, for 3 minutes per side. The parsnips should be lightly browned and crispy. Move onto paper towels with a slotted spoon and season with salt. *These can be done ahead of time. Drain the oil from the parsnips into a tin can (or something disposable.) Reheat the pan with cooking spray. Add the persimmons, season with cumin, salt, pepper, and the honey, and cook for about 6 minutes on medium heat, or until the persimmons are tender. Remove from the heat and set aside. When the pumpkin is removed from the oven, use a knife to remove the skin and cut the pumpkin meat into large, bite-sized pieces. To make the dressing: whisk together all of the ingredients so they are well combined. *This can also be done ahead of time. To assemble the salad, lightly toss the pumpkin, persimmons, and arugula together with half of the dressing. Lay onto a platter and sprinkle the parsnip chips on top. Drizzle with more dressing if desired. The salad can be served warm or at room temperature.